Our Horse Camp is perfect for beginner riders! Campers learn basic horse care, riding safety, and techniques such as mounting, dismounting, and controlling the horse. Campers spend two consecutive hours each day at the Ranch for riding and instruction. Campers learn basic horse care, riding safety, and techniques such as mounting, dismounting, and controlling the horse. Campers spend two consecutive hours each day at the Ranch for riding and instruction. Pony campers are assigned a horse of their own for the entire week of camp and share in daily care, grooming, feeding, and maintenance. 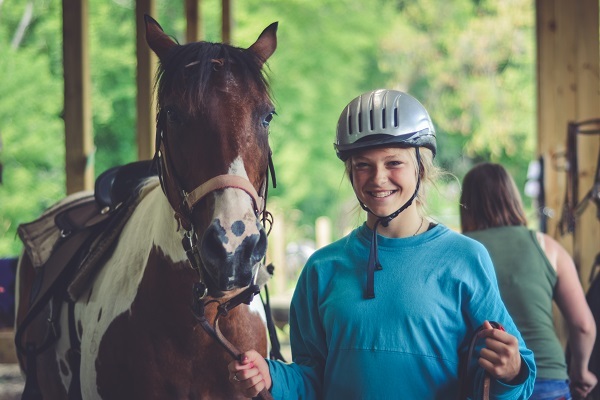 In addition, campers spend 2 hours each day riding western (weather permitting) and additional time learning about riding styles, working their way towards trail riding, and equestrian grooming and care. This program is for camper's who have completed the Ponies program or have equivalent experience. Campers will spend two weeks building on horse skills and experience more advanced trail riding. Campers go home on the weekend.